THE BOARD OFFICE HAS A NEW ADDRESS. CHECK THIS WEBSITE FOR OUR NEW ADDRESS BEFORE MAILING OR SHIPPING TO US. 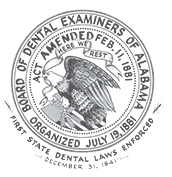 The Board of Dental Examiners of Alabama was established to ensure that every dentist and dental hygienist practicing in this state meets minimum requirements for safe practice. The practice of these professions is a privilege granted by the State. The Board of Dental Examiners is responsible for licensure, monitoring and ensuring the safe practice of dentists and dental hygienists in their service to the people of Alabama.